Father and son duos can be a hit and miss combination, Jerry and Ben Stiller have made millions making the world laugh and even with Jerry at 89 they’re still working together. On the other hand Philip II of Macedon and his son Alexander the Great not only became bitter rivals, the folks they encountered along their journeys hardly had smiles on their faces. 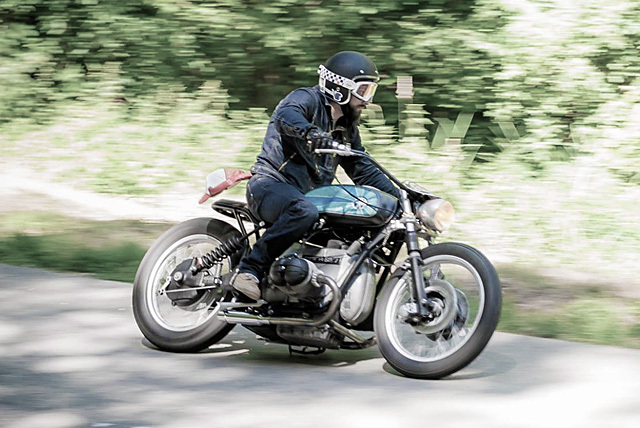 Luckily for the father and son team behind FrenchMonkeys, Lionel and Florian, they not only get on like a house on fire but their love for customising motorcycles has become a very successful business venture. Based in Lyon, France, their builds have become so popular there is now a waiting list for their services and their parts business is doing a roaring trade. 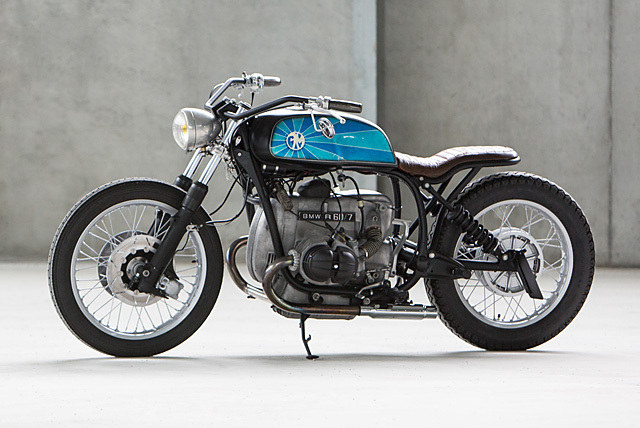 But after fifteen straight client builds it was time to create a bike for themselves and the BMW specialists have turned this 1978 R60/7 into a long and lean custom with plenty of classic style. 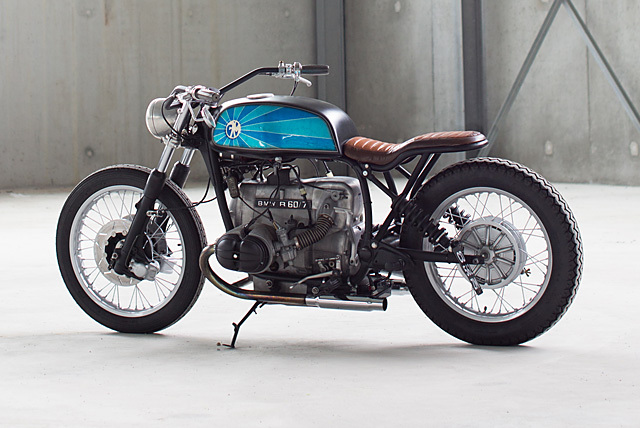 Although BMW’s are their bread and butter, the FrenchMonkeys store is full of tasty goods for the Bavarian bruisers, the pair have also built a host of other bikes including a wild chopper based on of all things a French Mobylette. But for their own build they chose to work with their first love and picked up this ex-Gendarmerie ’78 still carrying all the signs from its working years. 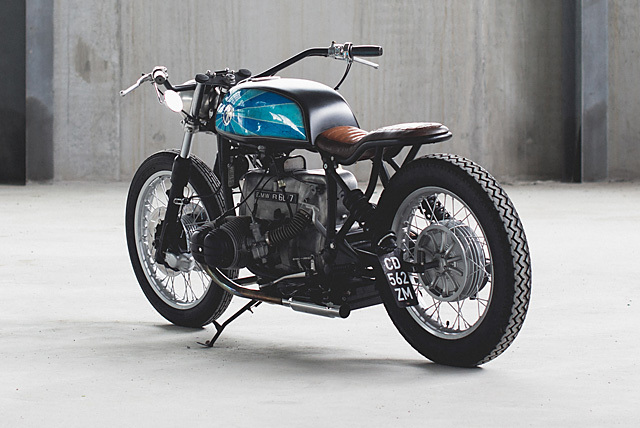 The styling was never designed to fit any particular genre but simply be an expression of the pairs motorcycling desires, “We were able to put all our creativity into it. 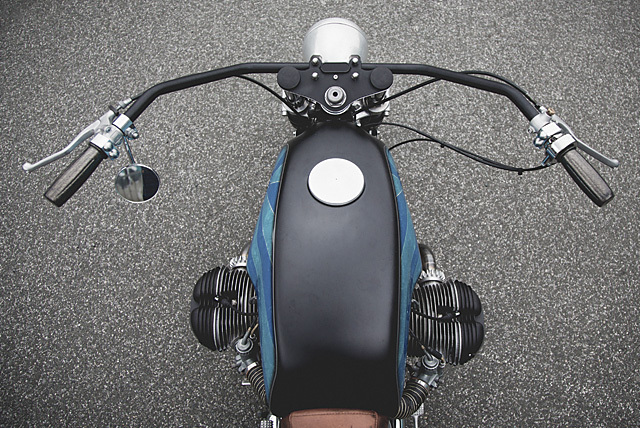 We love the lowered bikes, sleek and different!” To get things right the bike was taken back to the bare frame and wanting to go lower than they’d been before meant a change to the usual aftermarket rear subframes they make and sell. 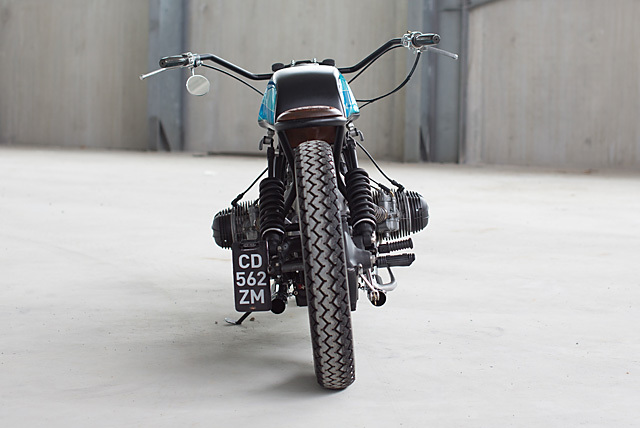 With the stock rear end removed the new item not only gives an entirely clean look to the back-end of the BMW, but brings the rider closer to terra firma with more raked out supports and lowered seating position. With the customising work done on the frame the main section and the swingarm were smoothed out and the whole lot given a coat of matte black frame and chassis paint. Attention to detail is a FrenchMonkeys trait and the frame has been given new bolts with the new fittings and bushings for the swingarm and subframe. With the lower and longer look Lionel and Florian were going for the seat style they normally mate to an R series BMW needed re-thinking and the seat base is now curved and shaped to match the lines of the metal work. With the base done it was over to their friends at Arts-upholstery to build up the foam and get it covered. Starting with leather from a 1955 grand club chair the seat was meticulously stitched together and the look is incredible, both the lines and the patina on the old material providing real character. The result is simply stunning and with the FrenchMonkeys logo sprayed on replacing the BMW badges and topped with an FMD aluminium cap that they sell in their online shop the tank alone is worthy of a feature. With a tank and seat combo so well done the accessories to complement them would always make or break the visual aspect of the build and the lads didn’t get it wrong. With risers mounted under the upper clamp a set of beach bars bolted to them gives the bike a standout classic look of coast cruising Triumphs and Harleys. “We opted for that huge Beach bar style handlebar for an enjoyable and different driving position.” Adding further elements of class and style is the beautiful Luxor headlight that just clears the bars and is straight out of the late ’40s. 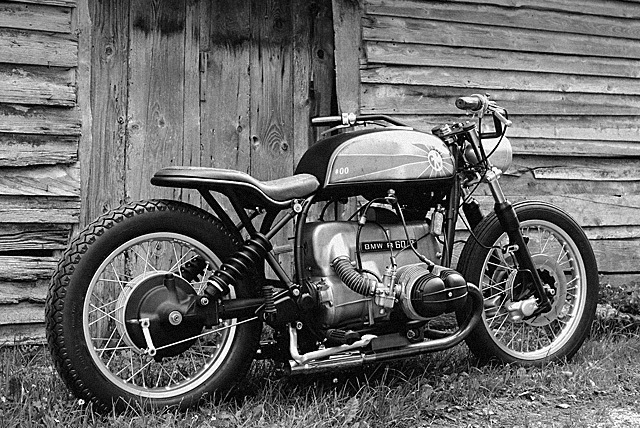 To give the BMW the stance it needed for the classic cruiser it was slowly becoming, the stock telescopic forks were rebuilt and internally lowered 8cm. New stanchions are clamped by totally refurbished triple clamps and the lower legs have been given a frame matching lick of matte black paint. Out the back a set of new shocks was required for the dropped down in the weeds look and with new mounting points fabricated into the custom frame the bike sits as level as possible. The hubs front and rear have been blasted and restored to a factory fresh look before being re-laced with stainless spokes to a set of new rims. With rebuilt brakes front and rear, an old school side mounted number plate and period correct rubber mounted up to the new wheels it’s all about creating a high-end look that takes you back to those bygone days. Of course what made the 60/7 such a sort after ride and has resulted in them still being on the road today is that built proof 599cc boxer twin. With a square bore there is nothing exhilarating about the way the BMW accelerates, it’s that it does it in a smooth and sophisticated way with a Swiss like watch precision just perfect for relaxed cruising. The block has been cleaned up and the valve covers given a coat of heat proof black paint but the engine is deliberately factory in its appearance. 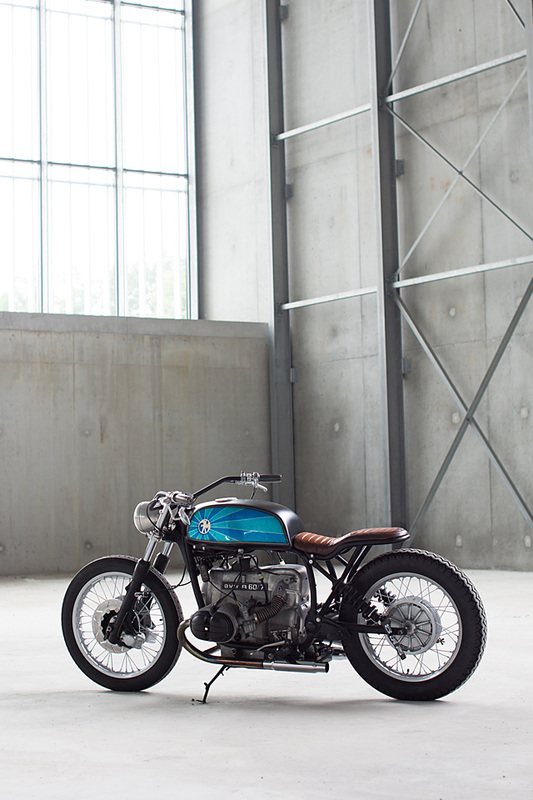 But such a bike deserves a slightly rorty sound and new stainless steel pipes finish with a pair of chrome hot dog mufflers under the pegs so you can really enjoy the boxers distinct heartbeat. One of the challenges with such a minimalist rear end was hiding all of the bikes electrics, a new loom was created, as much was hidden under the tank as possible and the battery now calls below the swingarm home. Finishing out the electrical setup is made much easier with an array of Motogadget parts that deliver the uncluttered look the FrenchMonkeys were going for. A tiny Motogadget digital speedo has been built into the top of the bars and when not illuminated you can barely tell it’s there. While the company’s raw metal switches have been fitted up to the big bars with matching levers, throttle assembly and some old school grips to finish it out. These days so many are intent on conforming to a certain style and following the unwritten rules that seem to go hand in hand but Lionel and Florian have instead followed their heart and created a ride that’s just for them. High quality craftsmanship, beautiful paint and leather and the thorough restoration of a classic gives them a custom like no other but in the end for Florian its simple “it is just a really nice bike to ride” and isn’t that what it’s all about!